Our senior services in Mechanicsburg. We understand finding the right fit and (when needed) the right care for yourself or loved one is important. And we work with many families to do just that. Unlike a skilled nursing facility offering only one level of care, we have designed a full range of senior services here in Mechanicsburg. With this, we can support residents in their current life stage and can continue to care for them if and when their needs should change. 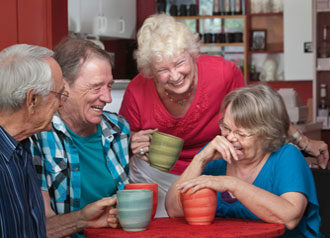 Independent Living enables active older adults to live without the burdens of home ownership. With the ease of apartment living, a continental breakfast and dinner offered each day plus available at The Bistro, weekly housekeeping, transportation to appointments and shopping and 24-hour access to staff. This lifestyle is for seniors who want to make the most of retirement life on their own terms. This lifestyle provides individualized assistance to residents who need help with daily living activities like dressing, bathing or medication reminders, so they can remain involved and active. Our Personal Care services include the amenities and privacy of apartment-style living, three meals per day in our restaurant-style dining rooms, plus a better quality of life with personal assistance. Our unique Connections Memory Support Services program provides personalized therapeutic care for seniors with first signs of dementia and early- to late-stage memory loss caused by Alzheimer’s disease and other types of dementia. This comprehensive program is offered in a variety of three settings, including our Personal Care apartments, supervised and secure neighborhoods. Contact us about our Mechanicsburg, Pa. dementia care service. Our Pathways Restorative Services™ addresses a full range of rehabilitation and restorative care for individuals needing a short-term stay to convalesce or desiring help dealing with long-term conditions. Based on a resident’s goals, this service customizes care plans to work toward those goals to help the resident be successful and lead a better quality life. At your convenience, we are available to answer any questions as you consider the right senior services in Mechanicsburg. Visit us any day of the week for a personalized visit and a complimentary lunch to see firsthand how we may fit your needs and life stage.